The iPad is the first tablet computer developed by Apple Inc. It is part of a device category between a smartphone and a laptop computer. Despite its known shortcomings (sun-blindingly shiny screen, thick and kinda heavy, no flipping’ camera), it was a solid device upon which Apple could launch its tablet OS. As for iPad generation 2, there’s been quite a bit of buzz around the next iPad. The rumors that started early stage about Apple holding an iPad 2 event on March 2nd are true. While iPad 2 has the following features: two cameras, front and back Thinner and lighter body Dual-core processor, with more RAM SD card slot, Dual GSM/CDMA chipset and Spill-proof body. But it seems there is no any built-in DVD-ROM or DVD player in iPad that can work with DVD and play DVD directly. You must have been considering those questions when you trying to find a good ripper on Mac OS: is there any effective way to transfer DVD to iPad or iPad 2? How to put and convert DVD movies to iPad/iPad 2 on Mac? 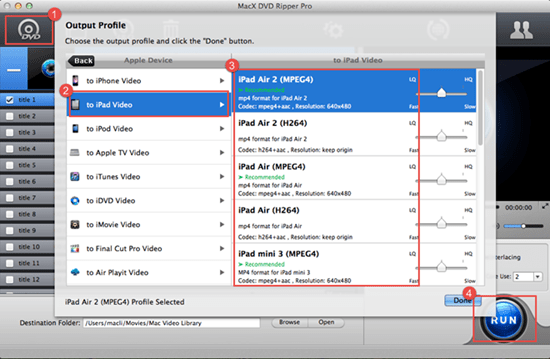 MacX DVD Ripper Pro is a powerful all-in-one DVD to iPad ripping software that makes it easy for you to rip DVDs and transfer DVD movie files. It can help you rip/transfer DVD movie to iPad even new iPad 2 videos (H.264 HD, H.264, MPEG-4), watch/get/transfer DVD movie onto iPad 2, iPad. Easily rip any protected DVD movies to iPad 2 supported formats MP4, MOV, AVI, H.264 etc on Mac devices and Windows (10). Fast speed and original quality! Step 1. Add DVD movies. After free download this DVD to iPad/iPad 2 ripper, you can click on the "DVD Disc" button if the DVD movie you need to convert is on your disc drive. In case you have saved it in a hard drive, click the “DVD Path” button and locate the folder. In the output format area, select the target format "to iPad". This Mac DVD to iPad/iPad 2 converter software is designed for all different types of iPad, therefore it also fully compatible with new iPad 2. Right click "Start" to begin your DVD to iPad 2 conversion. MacX DVD Ripper Pro will do the rest for you. After the ripping process is complete, transfer the converted video into your iPad/iPad 2 through the sync of iTunes Library to enjoy your movie in your fashionable iPad/iPad 2. For those who like to rip DVD to iOS devices, MacX DVD Ripper Pro also helps to rip DVD to MP4, QT, FLV, H.264, MOV, AVI, MP3, MPEG, M4V formats which are compatible with Mac OS popular applications like iPhone 6s/6s plus/6/6 plus, iPad Pro/Mini 4/3/2, iPad Air 2, Android etc.